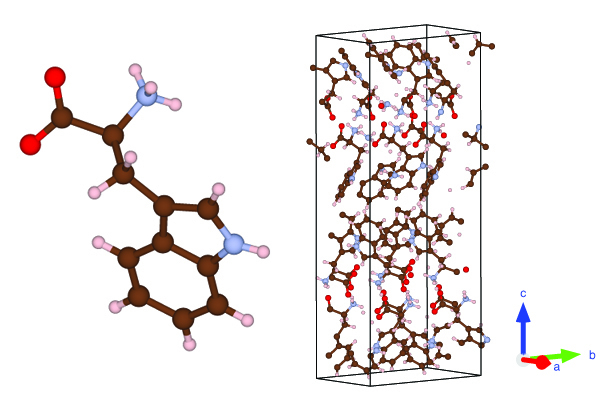 Your crystallographic Thanksgiving – Tryptophan! Our contributor from the good US of A, Sara Callori, celebrates Thanksgiving on Crystallography 365! As an American living in Australia, this is the time of year when I get a bit homesick for a real autumn, and this week I’m especially missing Thanksgiving. I could make up for it by hosting one myself, but since it’s basically summer Down Under, it’s way too hot to do all that cooking. However, I can celebrate in a crystallographic way – by posting the structure of tryptophan! Upon first encountering chalcopyrite, I was convinced it had to be a weird autocorrect rather than an actual mineral name. But after a bit of internet sleuthing, I learned that it’s a real, and very useful material. Also that it’s probably pronounced “calko-pyrite” rather than “cal-copyrite”, since it comes from the Greek words “chalkos” meaning “copper” and “pyrites” which means “striking fire”. 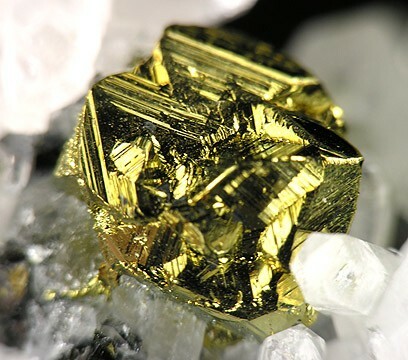 This stems from the fact that chalcopyrite, or CuFeS2, is a bright yellow semiconducting material with a metallic lustre and is often confused with gold or pyrite. However, it is much softer than pyrite and more brittle than gold. It has long been a primary source for copper and has contributed to technology in both Bronze Age societies and in the modern era. The chalcopyrite structure was first reported in 1931 by none other than Linus Pauling and graduate student Lawrence Brockway. While a previous study of the chalcopyrite structure was published in 1917, Pauling and Brockway demonstrated that it wasn’t quite right. You can find evidence of Pauling’s study in his lab notebook, although the data was put into Brockway’s notebook. A brief post on the history of this discovery can be found at The Pauling Blog. Why is bismuth our next crystal structure? Because bismuth crystals are just plain cool looking! 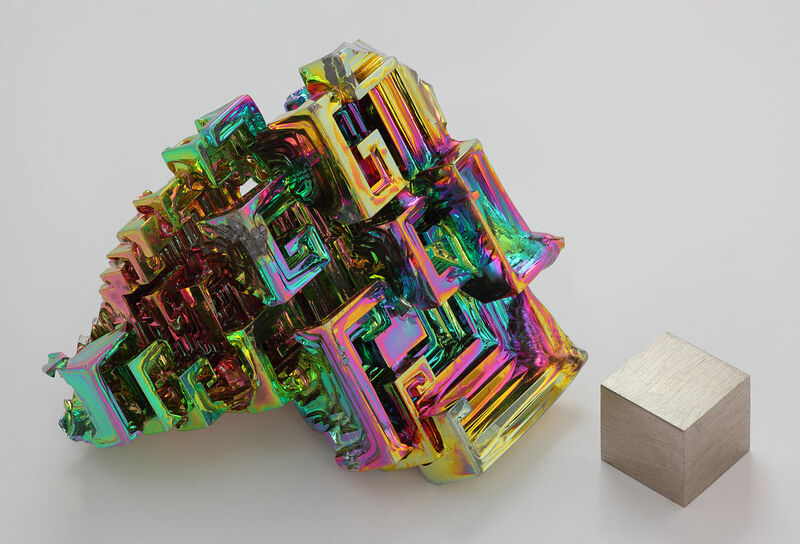 Bismuth is a commonly used metal, in part because of its low toxicity, and can be found in lots of everyday products like makeup and medications, including the aptly named Pepto-Bismol. Naturally, however, bismuth isn’t bright pink, but light gray, like in the cube above. The rainbow sheen on the large crystal actually comes from a surface oxide layer that forms on the bismuth during crystal growth. 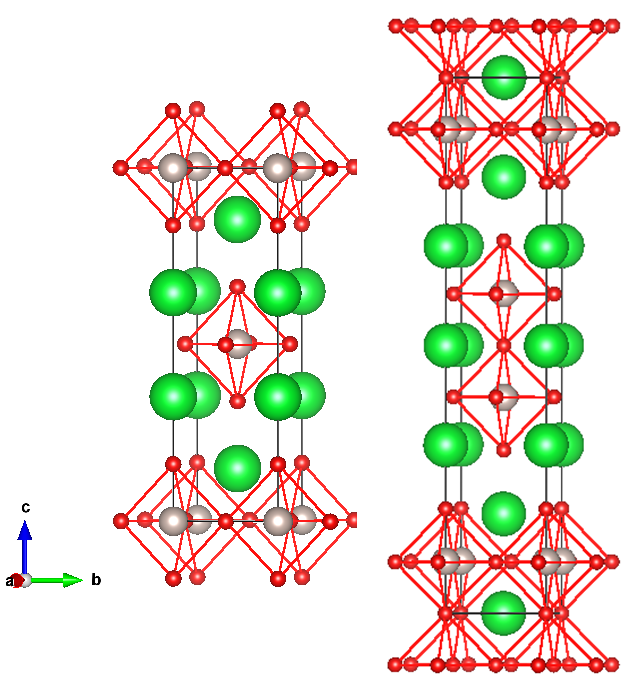 The crystal structure of bismuth is relatively simple, as is shown above. 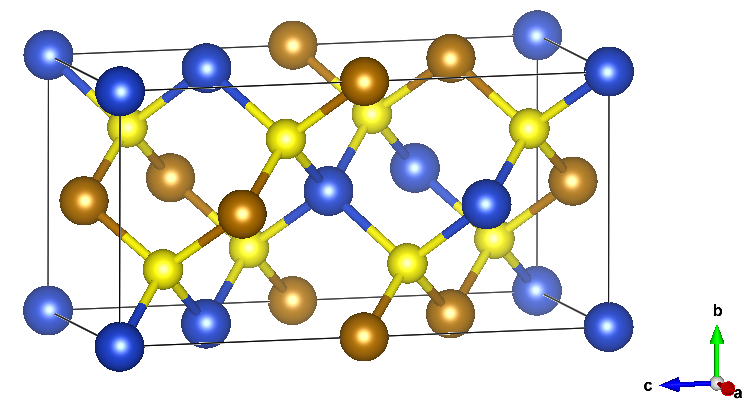 Bismuth has a rhombohedal unit cell, which means that here only two of the lattice parameters are the same and two of the angles in the unit cell are 90° while the third is 120°. 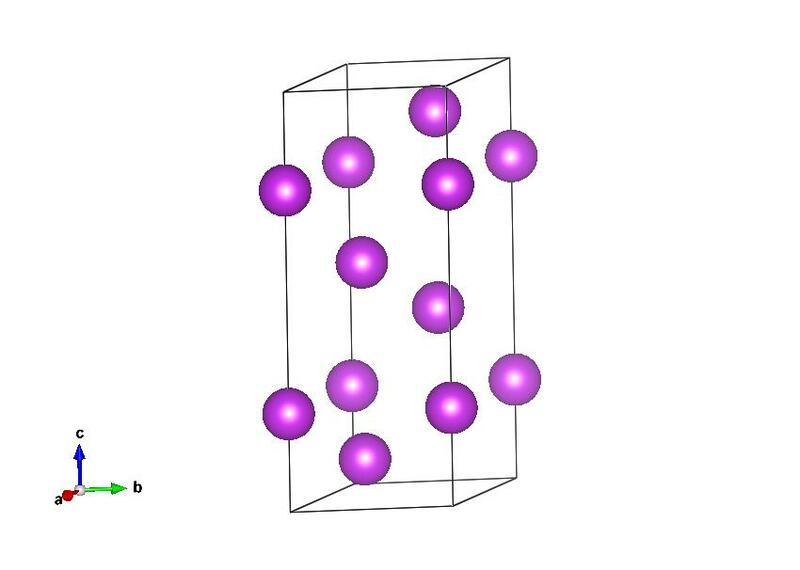 But this crystal structure isn’t what causes such a distinct type of crystal to form. This type of “staircase” like growth is called a hopper crystal. These types of crystals form because the outside of the crystal grows faster than the inside, so the large crystals never get “filled in”. However, the growth of the inside portion of the crystal is still dictated by the crystal structure, which is how the “step” features form. Since bismuth is a relatively safe and easy to obtain metal, you can actually make bismuth crystals at home in your kitchen (or garage if you happen to have a gas torch around). You can check out a video of stove-top bismuth crystals here. Putnisite is a brand new mineral that was recently discovered in Australia. As you can see in the structure above, there’s a lot going on within the structure, leading to the lengthy chemical name: SrCa4Cr3+8(CO3)8SO4(OH)16*25H2O. What makes Putnisite, which is named after mineralogists Andrew and Christine Putnis, is that it is truly a one-of-a-kind mineral. The authors of a recent paper introducing putnisite call it “unique among minerals and synthetic compounds”. The complex framework that makes up the crystal is not related to any other material that scientists currently know of. Even the elements that make up this material: strontium, calcium, chromium, sulphur, carbon, oxygen, and hydrogen, are an unusual combination. Putnisite was found in the Polar Bear Peninsula in Western Australia. 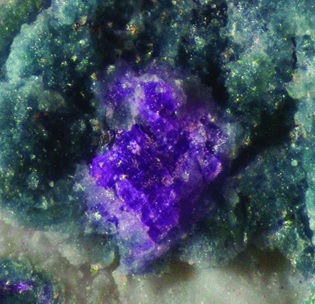 It appears as roughly ½ mm cubic crystals that are purple with pink streaks. 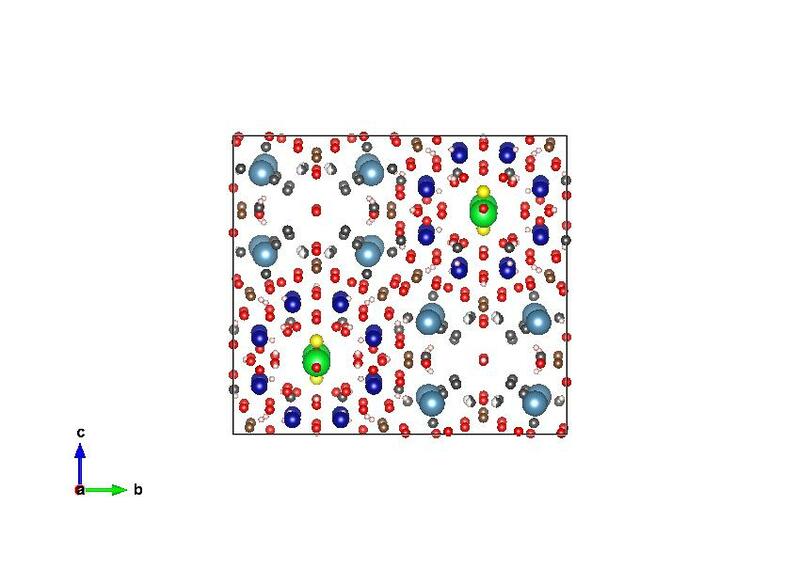 A detailed structure was recently reported in Mineralogical Magazine by lead author Peter Elliot from The University of Adelaide. Information can also be found in the American Mineralogical Crystal Structure Database.